It’s no secret that I’ve been trying to lose weight. I’m pretty sure everyone around the world sees me complain whine about exercising every day. However, Wednesdays are extra-special days. 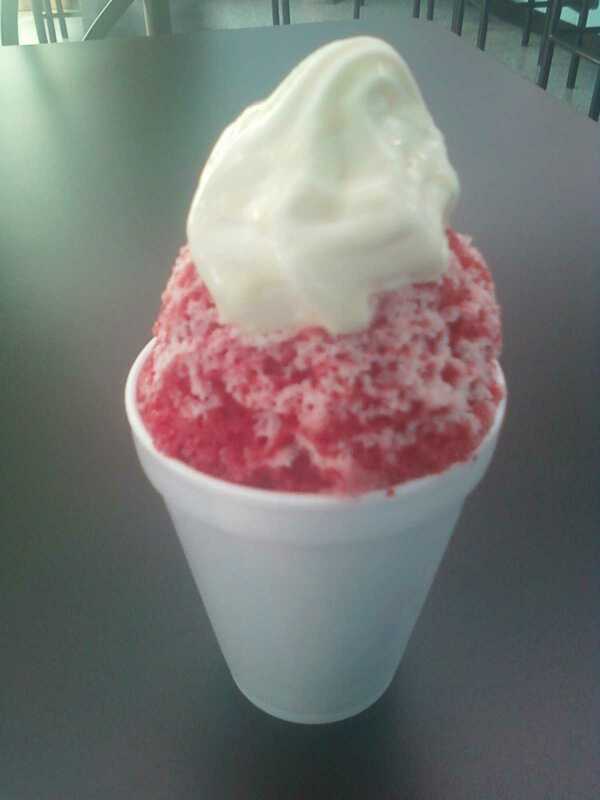 Because I completely off-set all the hard work I did earlier in the day by having a Sno 2 Go. Let me explain a little about what this is. They use the lightest, fluffiest shaved ice. It’s nothing like the crunchy little ice you get in a normal Sno-Cone. Just imagine the freshest, softest snow. Yeah, like that. They pack it in the bottom of your cup (always a small for me… I do have some limits). Then they put your flavoring on it and then add some soft-serve ice cream. Yes, you read that right. They take shaved ice, and then add soft-serve. Now, before you go thinking, “That sounds bizarre. That can’t possibly be good…” just know that you’re WRONG. I know because I’ve been there, thought that. Then they add more shaved ice. They top that shaved ice off with your flavoring and top it off with a very generous dollop of soft-serve and a drizzle of syrup. The flavorings themselves deserve their own paragraph. 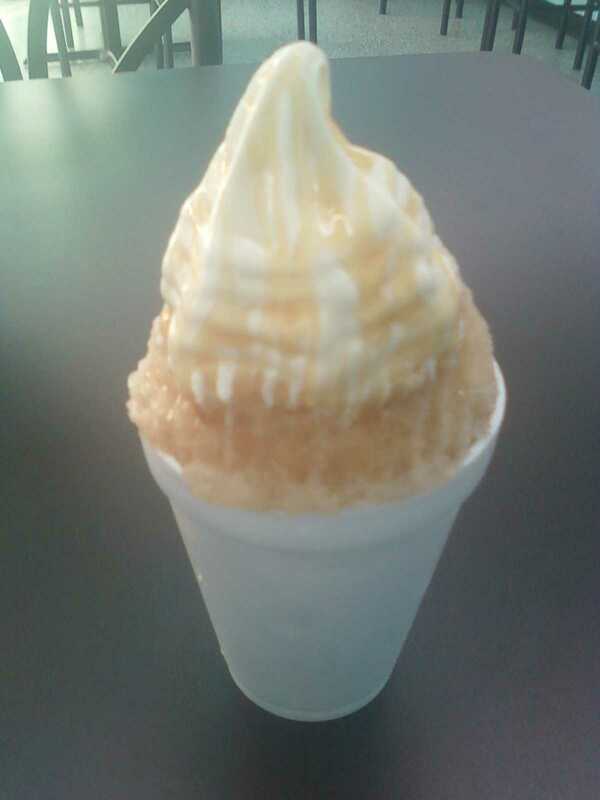 They have your standard sno-cone flavorings, and then they have their very special home-made flavorings. These are thick, delicious flavors and they taste exactly like what they are. By that I mean tonight’s Red Velvet Cake flavor tasted just like Red Velvet cake. Last weeks Spiced Chai tasted just like a Chai Frappuccino. You get the picture. Brad had Apple Pie tonight and he declared it his favorite thus far. The Strawberry Shortcake was excellent, as was their Peanut Butter Cup. 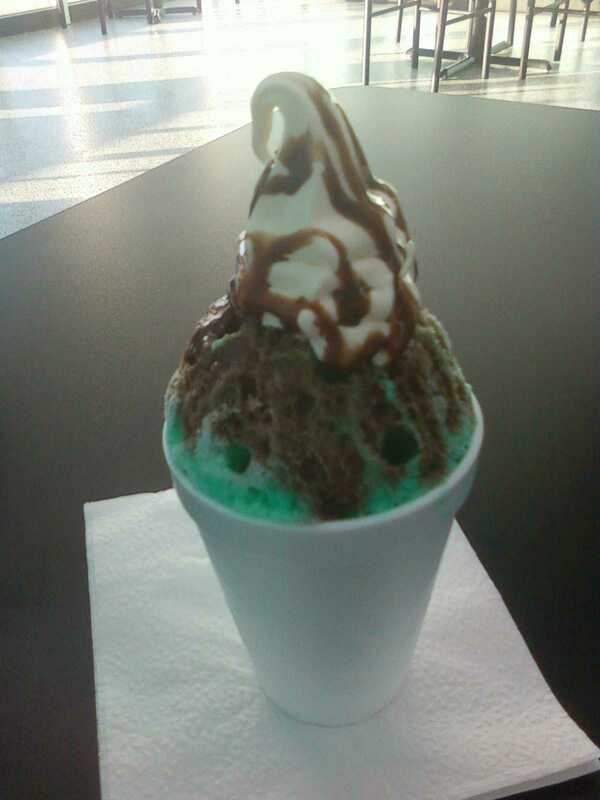 I wasn’t so crazy about the Mint Chocolate one, but only because the Spearmint flavor was a tad strong for my taste. I still have some flavors I have to try, and next week’s will be Carrot Cake. After that will be Fudgesicle, and then Apple Pie, and then…….. Yes, that’s what I call enjoying my “Dash”. Now, go Live your Dash! Way to go girl. Love the theme. It’s really purty! i want one please. thank you. see, i’m working on using my manners. LOL…Manners? What are those?! 😉 I’d totally send these out if I could. But I’d end up eating every last drop first!